A merger of technologies between an underwater drone and a sea sensor is making waves. SolarCity co-founder and cousin of Elon Musk, Peter Rive wants to help people and the scientific community discover under water environs. 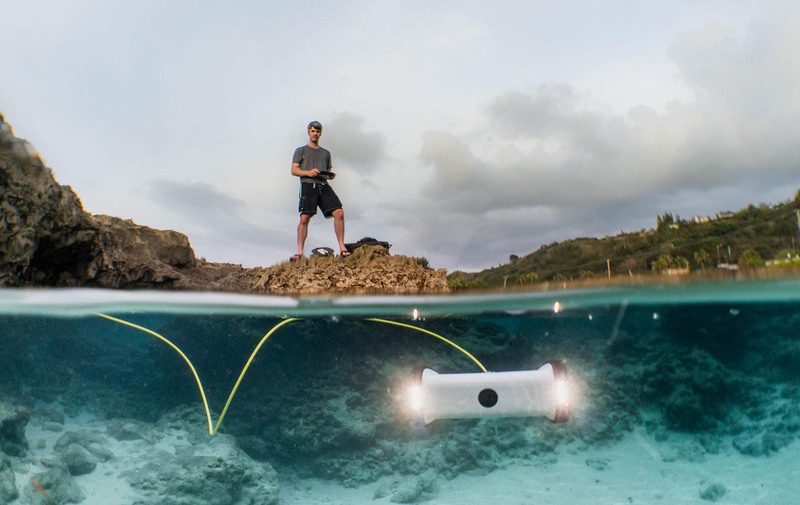 Peter Rive led a $7 million Series A for Sofar Ocean Technologies, a new startup formed from a merger he orchestrated between underwater drone maker OpenROV and sea sensor developer Spoondrift. Assembling together their 1080p Trident drone and solar-powered Spotter sensor for data collection above and below the water surface. This information could help users shoot awesome video footage, track waves and weather, spot fishing and diving spots, inspect boats or infrastructure for damage, monitor acquaculture sites or even catch smugglers! There is a variety of drones available for ocean exploration in the market today. Like the Saildrone, DeepTrekker and SeaOtter-2 that can be categorized as expensive professional research-focused devices; or the consumer-level devices like the $800 Robosea Biki, $1,000 Fathom ONE and $5,000 iBubble. With its capabilities of three hours of dive time and two meters per second speed the Sofar Trident, which requires a cord to a surface buoy to power sits in the middle of the pack at $1,700. Sofar co-founder David Lang thinks simplicity, robustness and durability will make the Trident the most popular in the market. Rive’s mission is to get enough sensors in the sea that relay more data on the progress of climate change and other ecological issues. “We know very little about our oceans since we have so little data, because putting systems in the ocean is extremely expensive. It can cost millions for sensors and for boats,” he says. So the Spotter, which costs $4,900 compared to $100,000 that some sea sensors cost, seems ideal for this purpose. Rive also says that many customers/ owners are eager to share data back to the startup and request for better data portability so they can share with fellow researchers. One of the reasons the startup attracted the funding from Rive and fellow investors True Ventures and David Sacks’ Craft Ventures is its belief that it can find ways to monetize that underwater data in the future. The funding will build up data business and also help Sofar develop safeguards to ensure its Trident drones don’t go where they shouldn’t. That’s imperative, given London’s Gatwick airport shutdown due to a trespassing drone.